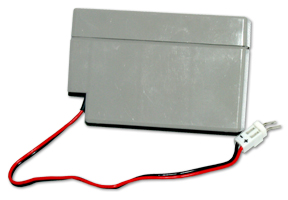 This compact, sealed rechargeable, 12 V battery is optimized for use with the CR200(X)-series dataloggers and the ENC200 Enclosure. The 16869 has an 0.8 Ah (800 mAh) capacity. CR200(X)-based systems requiring a larger capacity power supply may use the 17365 sealed rechargeable battery, which requires an enclosure larger than the ENC200.